The sacredness of Palestine in the esteem of the Jews is partly accounted for by the fact that it was the cradle and sepulcher of their Patriarchs and their "Promised Land." Moreover, many of the Mosaic laws could apply to Palestine only, and the holiness of these laws was largely reflected on the Holy Land. Palestine was distinguished as "a land which the Lord thy God cared for: the eyes of the Lord thy God are always upon it" (Deut. xi. 12). God calls it "my land" (Joel iii. 2). The term "holy land" is mentioned only once in the Bible (Zech. ii. 12). In rabbinical literature Palestine is generally known as "Ereẓ Yisrael" (Land of Israel). "Ereẓ ha-Ḳedoshah" (The Holy Land) is used more as a poetical expression. 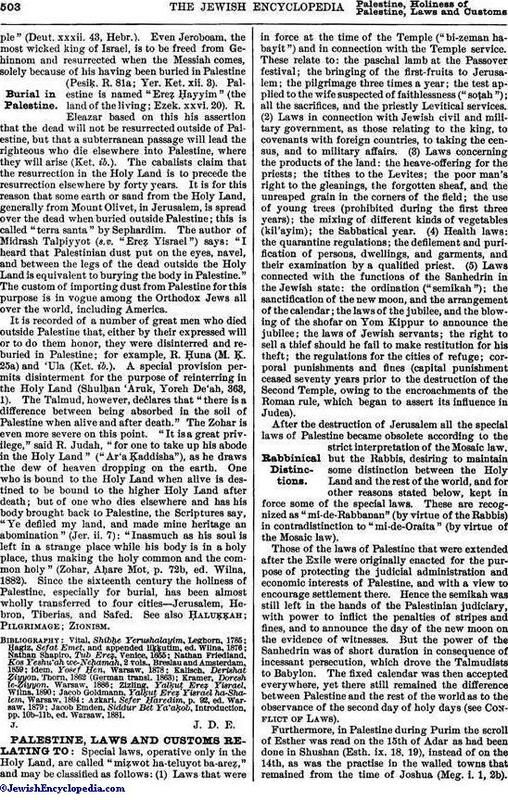 The Mishnah says, "Palestine is the holiest of all countries" (Kelim i. 6). From a legal standpoint, however, this holiness ceased with the destruction of the Temple and the dispersion of the Jewish people. Ezra resanctified Palestine on his return from Babylon; but whether or not the sanctification of Ezra continued after the Second Temple was destroyed is a moot question in the Talmud ('Eduy. viii. 6; Mak. 19a; Ḥul. 7a; 'Ar. 32a; Niddah 46b), and upon its solution, in exilic times, rested the validity of many obligations pertaining to tithes, the Sabbatical year (see Shemiṭṭah), etc. From a sentimental standpoint, however, the sacredness of Palestine never varied. "The Holy Temple built or destroyed, the Shekinah never moved from that place, as God promised at the dedication of the Temple: 'Mine eyes and my heart shall be there perpetually'" (I Kings ix. 3). The angels that guarded Jacob in Palestine were of a higher order than those elsewhere. The angels, it is said, used to change guard at Mahanaim (Gen. R. lxviii. 18). To be driven out of Palestine means, "Go, serve other gods" (I Sam. xxvi. 19; Ket. 110b). R. Simeon b. Yoḥai said, "Elimelech, Mahlon, and Chilion were the foremost men and leaders in Israel, and the only sin for which they were punished was their sin in leaving Palestine in time of famine" (B. B. 91a). One must not speak ill of Palestine. The wicked King of Assur merited the title "the great and noble Asnapper" (Ezra iv. 10) because he refrained from abusing the Holy Land, and held it in as much esteem as Babylon, when he said, "I [will] come and take you away to a land like your own land" (II Kings xviii. 32; Sanh. 94a). Veneration and love for Palestine were maintained by the Rabbis in many ways. R. Johanan declared that one who walks a distance of 4 cubits in Palestine may be confident of a share in the future world (Ket. 111a). "The merit of living in Palestine equals the merit of observing all the commandments." 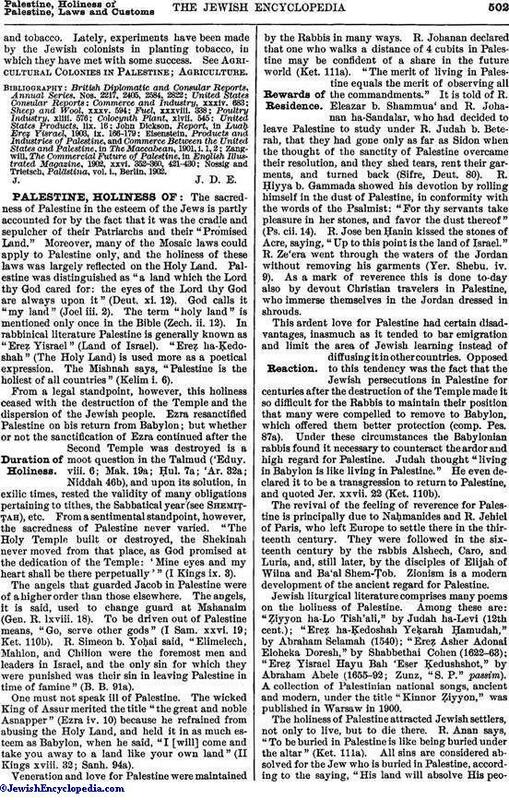 It is told of R. Eleazar b. Shammua' and R. Johanan ha-Sandalar, who had decided to leave Palestine to study under R. Judah b. Beterah, that they had gone only as far as Sidon when the thought of the sanctity of Palestine overcame their resolution, and they shed tears, rent their garments, and turned back (Sifre, Deut. 80). R. Ḥiyya b. Gammada showed his devotion by rolling himself in the dust of Palestine, in conformity with the words of the Psalmist: "For thy servants take pleasure in her stones, and favor the dust thereof" (Ps. cii. 14). R. Jose ben Ḥanin kissed the stones of Acre, saying, "Up to this point is the land of Israel." R. Ze'era went through the waters of the Jordan without removing his garments (Yer. Shebu. iv. 9). As a mark of reverence this is done to-day also by devout Christian travelers in Palestine, who immerse themselves in the Jordan dressed in shrouds. This ardent love for Palestine had certain disadvantages, inasmuch as it tended to bar emigration and limit the area of Jewish learning instead of diffusing it in other countries. Opposed to this tendency was the fact that the Jewish persecutions in Palestine for centuries after the destruction of the Temple made it so difficult for the Rabbis to maintain their position that many were compelled to remove to Babylon, which offered them better protection (comp. Pes. 87a). Under these circumstances the Babylonian rabbis found it necessary to counteract the ardor and high regard for Palestine. Judah thought "living in Babylon is like living in Palestine." He even declared it to be a transgression to return to Palestine, and quoted Jer. xxvii. 22 (Ket. 110b). The revival of the feeling of reverence for Palestine is principally due to Naḥmanides and R. Jehiel of Paris, who left Europe to settle there in the thirteenth century. They were followed in the sixteenth century by the rabbis Alshech, Caro, and Luria, and, still later, by the disciples of Elijah of Wilna and Ba'al Shem-Ṭob. Zionism is a modern development of the ancient regard for Palestine. Jewish liturgical literature comprises many poems on the holiness of Palestine. Among these are: "Ẓiyyon ha-Lo Tish'ali," by Judah ha-Levi (12th cent. ); "Ereẓ, ha-Ḳedoshah Yeḳarah Ḥamudah," by Abraham Selamah (1540); "Ereẓ Asher Adonai Eloheka Doresh," by Shabbethai Cohen (1622-63); "Ereẓ Yisrael Hayu Bah 'Eser Ḳedushshot," by Abraham Abele (1655-92; Zunz, "S. P." passim). A collection of Palestinian national songs, ancient and modern, under the title "Kinnor Ẓiyyon," was published in Warsaw in 1900. The holiness of Palestine attracted Jewish settlers, not only to live, but to die there. R. Anan says, "To be buried in Palestine is like being buried under the altar" (Ket. 111a). All sins are considered absolved for the Jew who is buried in Palestine, according to the saying, "His land will absolve His people"(Deut. xxxii. 43, Hebr.). Even Jeroboam, the most wicked king of Israel, is to be freed from Gehinnom and resurrected when the Messiah comes, solely because of his having been buried in Palestine (Pesiḳ. R. 81a; Yer. Ket. xii. 3). Palestine is named "Ereẓ. Ḥayyim" (the land of the living; Ezek. xxvi. 20). R. Eleazar based on this his assertion that the dead will not be resurrected outside of Palestine, but that a subterranean passage will lead the righteous who die elsewhere into Palestine, where they will arise (Ket. ib.). The cabalists claim that the resurrection in the Holy Land is to precede the resurrection elsewhere by forty years. It is for this reason that some earth or sand from the Holy Land, generally from Mount Olivet, in Jerusalem, is spread over the dead when buried outside Palestine; this is called "terra santa" by Sephardim. The author of Midrash Talpiyyot (s.v. "Ereẓ Yisrael") says: "I heard that Palestinian dust put on the eyes, navel, and between the legs of the dead outside the Holy Land is equivalent to burying the body in Palestine." The custom of importing dust from Palestine for this purpose is in vogue among the Orthodox Jews all over the world, including America. It is recorded of a number of great men who died outside Palestine that, either by their expressed will or to do them honor, they were disinterred and reburied in Palestine; for example, R. Ḥuna (M. Ḳ. 25a) and 'Ula (Ket. ib.). A special provision permits disinterment for the purpose of reinterring in the Holy Land (Shulḥan 'Aruk, Yoreh De'ah, 363, 1). The Talmud, however, declares that "there is a difference between being absorbed in the soil of Palestine when alive and after death." The Zohar is even more severe on this point. "It is a great privilege," said R. Judah, "for one to take up his abode in the Holy Land" ("Ar'a Ḳaddisha"), as he draws the dew of heaven dropping on the earth. One who is bound to the Holy Land when alive is destined to be bound to the higher Holy Land after death; but of one who dies elsewhere and has his body brought back to Palestine, the Scriptures say, "Ye defiled my land, and made mine heritage an abomination" (Jer. ii. 7): "Inasmuch as his soul is left in a strange place while his body is in a holy place, thus making the holy common and the common holy" (Zohar, Aḥare Mot, p. 72b, ed. Wilna, 1882). Since the sixteenth century the holiness of Palestine, especially for burial, has been almost wholly transferred to four cities—Jerusalem, Hebron, Tiberias, and Safed. See also Ḥaluḳḳah; Pilgrimage; Zionism. Jacob Emden, Siddur Bet Ya'aḳob, Introduction, pp. 10b-11b, ed. Warsaw, 1881.